Fists aren’t the only striking thing in Dragon Ball FighterZ. Its stages, inspired by the landmark anime, are gorgeous. Excited about the game’s great stages, we reached out to Dragon Ball FighterZ producer Tomoko Hiroki about what developing them was like. Rendered with immense detail, but also with big, anime-style lines, Dragon Ball FighterZ stages add lots of character to the fighting game. They gracefully toe the line between beautiful and distracting. They feel like slices of a larger, fleshed-out world. Perhaps the game’s most striking stage is Namek, a sparsely-populated planet with three suns. Its atmosphere is lily pad green and its landscape is turquoise. It’s also full of dinosaurs. Hiroki said Namek was the hardest stage to design because it was her team’s first. “This was when we had to decide how and where we wanted to go with the art style when developing the stage,” Hiroki explained. In the series, we see a lot of Namek, but it’s mostly just landscape. There’s a village. There’s lots of rocks, trees and islands. And then there’s a lot of fighting. There wasn’t a ton to go off. In Dragon Ball FighterZ, Hiroki replicated Namek’s landscape, covered in blue grass and lollipop trees, but made sure to add in indications of life. The villain Frieza’s spaceship from the Dragon Ball Z series appears on the left of the map and, nearby, there’s a small Namekian hut (which gets destroyed after big attacks). When fighters ascend into the sky, a Namekian farm is visible. 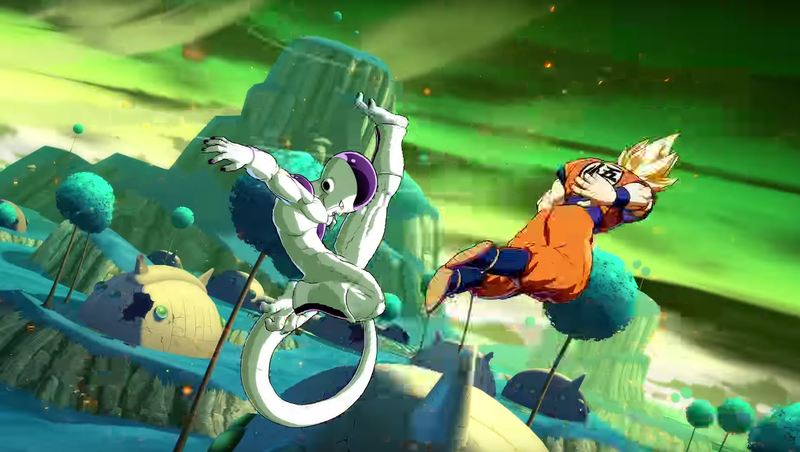 Although the anime shows just a slice of what goes on on Namek, the planet seems full with native activity when Dragon Ball FighterZ’s camera movements slowly reveal each element. Namek’s sky wasn’t an extremely active and interesting thing in the anime—especially since it’s always sunny. Hiroki implemented cloud movements to make the sky “livelier,” she said, “while maintaining the elements that represent the landscape.” In the game’s Namekian sky, streams of clouds flow toward a focal point in the background. It gives a big effect while characters fight each other in 2D.